Ford is working with Weyerhaeuser – one of the largest forest products companies in the world – to find a more sustainable plastic composite material for future Ford vehicle components. As I learned when visiting Ford Motors in Dearborn earlier this year, Ford already uses a variety of sustainable materials throughout its lineup, including soybean-based cushions and head restraints that save about 5 million pounds of petroleum annually. In the video above, come with me to Ford Motors in Dearborn, Michigan as I heard directly from Ellen Lee, Plastics Research Tech Expert and Angela Harris, Plastics Research Engineer with Ford Motor Company's Sustainable Materials Lab and see how Ford makes materials out of sustainable foods like coconuts and soybeans. The Ford biomaterials research team has been working with forest products leader Weyerhaeuser (NYSE: WY) to investigate the use of a plastic composite material utilizing cellulose fibers from trees in place of fiberglass or mineral reinforcements. Because the cellulose fibers in this new composite come from sustainably grown and harvested trees and related byproducts, such as chips, the environmental impact of building cars could be lessened. Specifically, replacing fiberglass, minerals and/or petroleum with a natural, plant-based material can sequester CO2 and ultimately lead to a smaller carbon footprint, among other benefits. Ford’s research has found that Weyerhaeuser’s cellulose-based plastic composite materials meet the automaker’s stringent requirements for stiffness, durability and temperature resistance. Additionally, components weigh about 10 percent less and can be produced 20 to 40 percent faster and with less energy when made with cellulose-based materials compared with fiberglass-based materials. These weight and process savings can enable equivalent or reduced component costs. “Our responsibility to the customer is to increase our use of more sustainable materials in the right applications that benefit both the environment and product performance,” said John Viera, Ford global director of Sustainability and Environmental matters. "If you could reduce the weight of the vehicle, you're going to be able to move that vehicle more efficiently." Ford's Global Director of Sustainability and Vehicle Environmental Matters discusses the future of fuels and gives the secret to fuel efficiency - lightweighting. 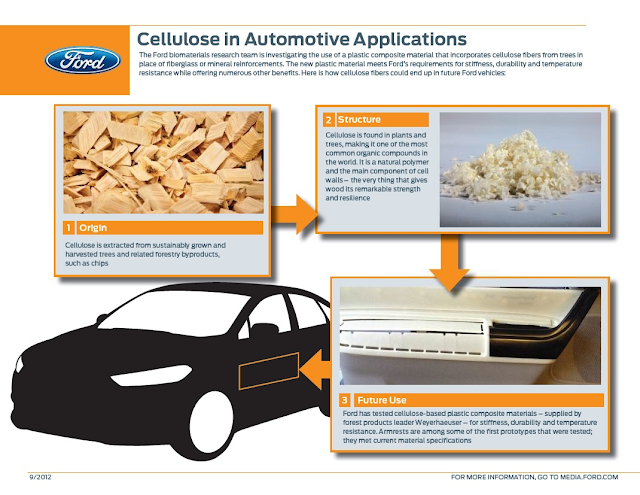 And like other less-than-obvious candidates for use in vehicle components, such as retired and shredded paper currency, the cellulose-based plastic composite material could be as important to Ford as soybeans have become. 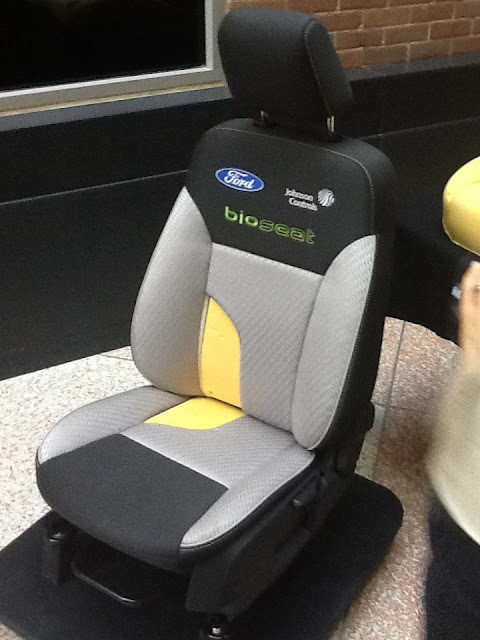 Ford uses soybean-based cushions in all of its North American vehicles such as the all-new Fusion, saving about 5 million pounds of petroleum annually. About three years ago, Ford began working with Weyerhaeuser to evaluate the use of a cellulose-based plastic composite material for potential use in vehicle components. Various prototype vehicle components were created from the cellulose-based material and put through a battery of tests by a team led by Dr. Ellen Lee, Ford’s plastic research technical expert. For example, prototype armrests were tested as potential components that could feature the cellulose-based material. Not only can the cellulose material be used in interior applications, but the high level of performance provided by the cellulose fibers also makes it a good candidate for exterior and under-the-hood applications as well. “Cellulose fiber is a great renewable resource that already has established infrastructure around the world, making it an ideal material for Ford’s global products,” said Lee. Weyerhaeuser alone oversees more than 20 million acres of sustainably managed and third-party certified forestland around the world and plants more trees than they harvest. “Weyerhaeuser is a pioneer in sustainable forestry. Last year, for example, we planted more than 66 million seedlings as part of an ongoing process of renewal that ensures forests and the products that come from them meet present and future needs,” said Don Atkinson, vice president market development and new products for Weyerhaeuser’s Cellulose Fibers business. Information about the additional sustainable efforts of Ford Motor Company can be found in its 13th annual Sustainability Report titled “Blueprint for Sustainability: Accelerating Ahead” – a voluntary and comprehensive annual account highlighting all things sustainable, from people to products.